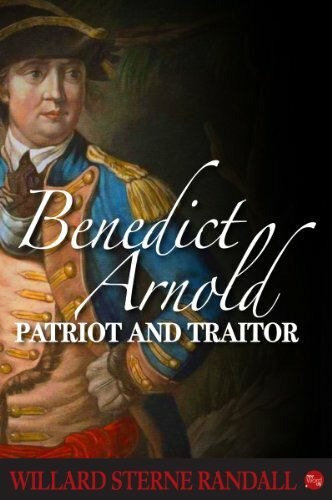 Benedict Arnold: Patriot and Traitor by Willard Sterne Randall is a comprehensive and rich biography. This is a book that goes beyond a simple life story and delves into multiple aspects of the time and place in which Arnold lived. It digs into the social, religious, philosophical, political and military issues that relate to the American Revolution. Born in 1741 Connecticut, Arnold was raised in a middle class family that began to run into financial difficulties as he moved through adolescence. As a young man, Arnold engaged in his own commercial endeavors and built a successful shipping business. He became active in the Patriot cause as the American Revolution loomed. At the outbreak of war, Arnold distinguished himself on the Northern Front. Rising to the rank of General, he proved himself in battles that raged from Quebec, Canada down through Northern New York State. He gained a reputation for brilliant generalship as well as courage under fire. He was primarily responsible for the American victory at Saratoga, which is considered the turning point of the war. It was in this battle that he was seriously wounded for the second time. 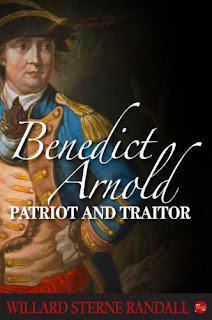 Throughout his career as a Patriot general, Arnold was hounded by political opponents. Like many American officers at the time, Arnold was involved in constant political strife. A streak of vanity and combativeness in his personality precipitated and inflamed these conflicts. Stemming from these political machinations, Arnold’s enemies in the army and Congress initiated a never-ending series of investigations and prosecutions against him. These attacks were often, but not always, unfounded. They generally centered around financial improprieties and often related to personal vendettas. Throughout this time, he was not paid his salary, which added to his financial difficulties. In 1779, he married Peggy Shippen. His new wife came from a Loyalist family. During his courtship, Arnold was military governor of Philadelphia. Likely as a result of his relationship with Peggy, Arnold both socialized with and protected Loyalist families, which further antagonized his enemies. It also moved him closer to Loyalist circles and their cause. As attacks on him intensified, through Peggy’s influence and connections, he eventually established contacts with the British and initiated negations to betray the American side. Plans were hatched in which Arnold was to surrender major American fortifications as well as betray Washington and allow the British to capture the American leader. Had the plan worked, it might have cost the Americans the war. When Washington discovered the plot, Arnold managed to barley escape to the safety of British lines. Made a General and given a command by the British, he successfully led British forces on several occasions. Arnold finished the war in their service. After the war Arnold and Peggy lived in both Canada and England. Arnold rebuilt his shipping Empire and continued to live an active life. He engaged in warfare as a private citizen in the Caribbean during the early Napoleonic Wars. He constantly battled those who sought to besmirch his reputation. He died in 1801. As I alluded to above, this is a big biography that extends out in all sorts of directions. I should note that among the many other subjects covered, Randall devotes quite a few pages to military history. Battles that Arnold was involved in are described in detail, as is the inner working of the command structure that he was a part of. Some readers might find this not to their tastes. I found it unusual that this was included in a book that also contains so much in the way of social and other types of history. Personally, I enjoyed it all. Randall does highlight Arnold’s flaws, including his early participation in the intimidation of loyalists, his committing of some corrupt acts, his vanity and his combativeness. With that, this work is generally sympathetic to its subject. 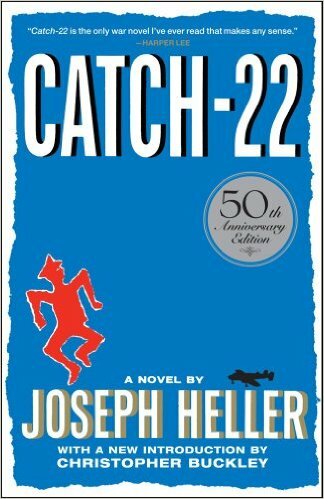 The author paints a picture of a heroic but flawed man. It illustrates how Arnold, though combative, was wronged in many ways by his country and pernicious men who should never have been in power. As an individual who had done so much for the Revolution, shown physical heroism and given up much of his health and wealth for the cause, the attacks on his character were difficult for Arnold to take to. They were the main motivator for him switching sides. Arnold’s decision to go over to the British is an ethical question. It is true that he was unfairly hounded by his enemies. More than just annoyances, these attacks threatened the financial well-being of his family, his reputation and the future of his military career. Nevertheless, acting as he did from selfish motives seems unethical. However, what conclusions did Arnold draw about a Revolution that turned on one of its most competent and brave military leaders and elevated capricious people to power? Though we now have the hindsight to know that these attacks only occupy a small footnote in history, a logical conclusion could have been drawn by Arnold that the Revolution was heading into corrupt and chaotic ground. He ultimately thought it better to side with the British at that point. With the above in mind, I still find it difficult to defend Arnold’s actions. His tendency to immerse himself in personal conflict with his peers, combined with the fact that he could have left military service instead of switching sides, adds to the case against him. In the end, he betrayed his country, his comrades and his friends. This is an excellent biography. I have only scratched the surface of its content above. Arnold is such an important figure in American history as well as in American mythology that his life is well worth exploring. Randall covers his subject in great detail, and he does so fairly. He expands the subject to cover many aspects of the times. I highly recommend this to anyone interested in American History or in just a great biography of this fascinating historical figure. 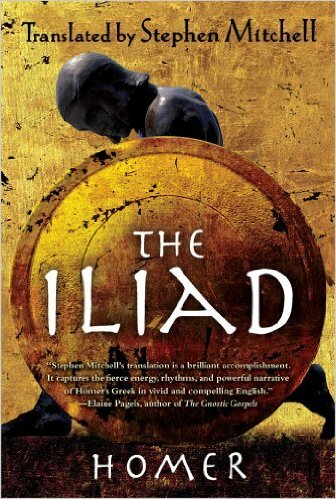 Passages from the Iliad quoted below are from the Alexander Pope translation. There are many reasons to read. One very good reason is that books allow us to deeply connect with other minds and explore various viewpoints in detail. Furthermore, these connections and explorations can be made with authors who are very different from us. Reading can bridge gaps between politics, culture, gender, philosophes, etc. I want to write a few words about how books can bridge the gap of time. The Old Testament, The Ramayana, Plato, Homer and the Greek playwrights, to name a few of the ancient works, at times exhibit uncanny similarity to our modern thinking and views. At other times they exhibit thoughts that seem very alien. A modern reader exploring these ancient texts may notice a dichotomy in his or her thoughts. First, it is striking as to what has not changed over time and across cultures. For instance, certain human emotions and traits, such as anger, jealousy, ambition, honor, a sense of fairness, friendship, etc., seem to have not changed all that much over time. Likewise, the pattern of certain human actions, particularly violence, seems very similar across the centuries. Though the language is ancient, the above sentiment and reaction seem very familiar. It is not unlike the reaction many people living in the twenty-first century have toward death. Yet, other ideas, ideals and mores seem so different when viewed over the expanse of time. In these ancient works, there seem to be no value in certain things that we so much esteem. The concepts of equality, self-determination and the appreciation of diversity are mostly missing from the early texts. These values are the cornerstone of much that is good in our modern society. Love, though present in all eras, also seems to have changed. Once again, the sense of equality and communication, and mutual respect give and take between partners seems to be absent in the ancient books. In the very same Iliad, love and marriage between men and women is portrayed as something very close to slavery. For instance, Briseis, captured by the Greeks during the course of the war, seems to show real love for Achilles, who also shows affection for her. Yet, throughout the narrative, Achilles and the other Greeks treat her like a spoil of war and a slave. These are just a few examples. Delving into classic works leads to many similar observations. It is not just the works of antiquity that seem different. Every time period, even that of a few decades past, show variation in ideas and values. The culture that surrounded a particular writer reached through time and touches us when we read particular works today. 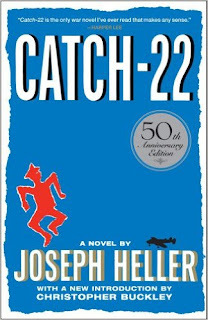 For instance, books written in the 1960s, such as Thomas Pynchon’s Gravity’s Rainbow or Joseph Heller’s Catch 22, exude cynicism and distrust of institutions and authority that seem unique to their time. Nineteenth century writers, such as Jane Austen and Charles Dickens, valued certain virtues such as chastity and reputation in ways that authors in different eras did not. Thus, a careful reading of older works can tell us a lot about the times that they were written in. It is enlightening to examine what is different, as well as what is the same, in comparison to our own time and culture. In addition, as one reads more and more, it illuminates how certain values and ideas have developed and changed over time. Our traditions and folklore are obvious connections to the past. Archeologists examine the physical manifestations that our ancestors left behind. Historians also often look into writing, but the writing of record keeping, diaries and everyday interactions. It is in literature and philosophy that people of the past speak to us most directly. Exploring ideas and values of the past is one of many benefits to reading. One can learn so much about history, culture, psychology, etc. by examining how ideas and beliefs changed, or did not change, over time. How humans developed and maintained ideas is one of the reasons that reading the great works can help us to better understand the world. This helps us to illuminate not just the past, but our own times as well.